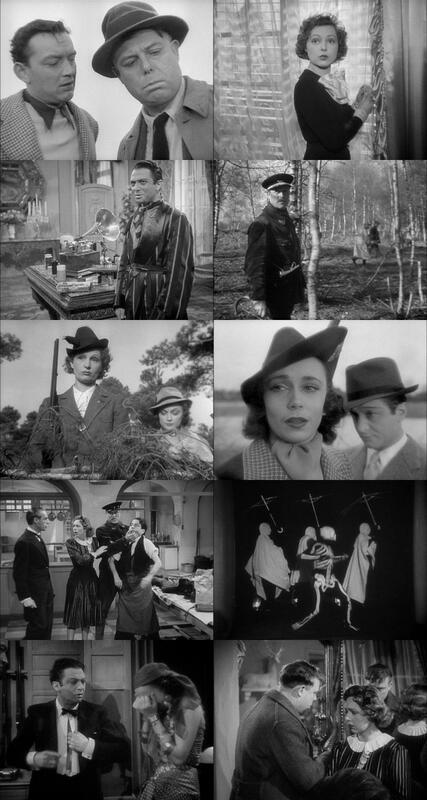 The Rules of the Game (1939), directed by Jean Renoir. Marquis: Put an end to this farce! Butler: Which one, my lord? The Rules of the Game is often cited as one of the greatest films in the history of cinema. The decennial poll of international critics by the Sight & Sound magazine ranked it #10 in 1952, moved it up to #3 in 1962, and #2 in 1972, 1982, and 1992; in 2002 it fell back to #3, behind Citizen Kane (1941) and Vertigo (1958). It's the Citizen Kane (1941) of France! (At least I'm there for Vertigo (1958)). I saw this once before and all I remembered was a somewhat bitter semi-comic farce about a weekend shooting party at a rich country estate. That's more commonly an English setting but the French can do it too. The director (who also acts in the film -- he's the man with the hat in the first pane below) said he wanted to make an unserious drama, but everyone since has taken it as political and social satire. It had a disastrously controversial opening and was banned by the government. The commentary track fills in a lot. I don't follow the language well enough to pick up on who says tu vs vous. I did not know that certain snatches of music are associated with old political factions, and am not familiar with the theater and opera pieces the film plays off. Most importantly, the social divisions of pre-War France seem long ago and far away and I have a hard time recognizing the issues and players. For example: the Marquis is a Jew and his wife is Austrian (as was true of the actors) and this was considered an insult to the upper classes. The opening night audience rioted and nearly burned down the theater. The commentary presents so many parallels, pairings and love triangles, so many layers of metaphor that I have to wonder if anyone can keep it all in mind while watching the movie. But even if so: is this what makes one of the greatest films in the history of cinema? Like Citizen Kane (1941) it is praised for technical innovation and actually has a deeper story. Criterion Blu-ray. The improvement over their previous DVD is modest, perhaps negligible in many scenes. As stated above, the commentary track is helpful, although like a lot of literary criticism it uses declamation rather than argument or discussion. Maybe there was no time for anything else. ClassicFlix has the Blu-ray, Netflix doesn't.